Fusion Art has invited entries for its second quaterly group online exhibition which is open to all artists and photographers all over the world. The best work in any subject is accepted for entry. Regardless of the nationality and location the artists and photographers can submit real or surreal photos and even abstract ones. Entrants are encouraged to enter multiple images as the group exhibition will highlight the accepted artists and provide an opportunity to showcase a small body of their work. Upto five winners in each category will be chosen to participate in the online group exhibition. A nonrefundable entry fee of $45 for up to 5 images. Artists may enter the competition more than once if they have more than 5 works they want to be considered. Artists will receive a digital award certificate, event announcement and copy of the press release for their art portfolio. A video of the group exhibition will be created and available on the exhibition webpage and Fusion Art's YouTube channel. The artists will be promoted on the website, in online press releases to more than 70+ outlets, in online event calendars, art news websites and through the gallery’s social media outlets. Links to the artist's website will be listed on the exhibition page and should result in increased traffic to the artist's website. Fusion Art's objective is to promote the artists, worldwide, to art professionals, gallerists, collectors and buyers. All inquiries from potential buyers will be directed to the artist for negotiation. Fusion Art does not take a commission on any sale that results from the online exhibition. 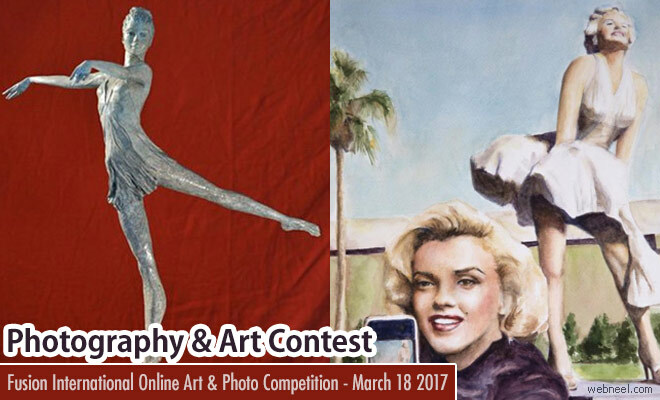 Fusion International Online Art and Photo Competition - March 18 2017 Neel Fusion Art has invited entries for its second quaterly group online exhibition which is open to all artists and photographers all over the world. The best work in any subject is accepted for entry.